The PiKon is a telescope that uses 3D printed parts and a Raspberry Pi with camera to capture images. A conventional (Newtonian) reflecting telescope uses a concave mirror (objective) to form an image which is then examined with an eye piece. So that you don’t get your head in the way while viewing, there is a 45 degree mirror placed in the telescope tube and the eye piece is mounted on the side with a focusing rack. 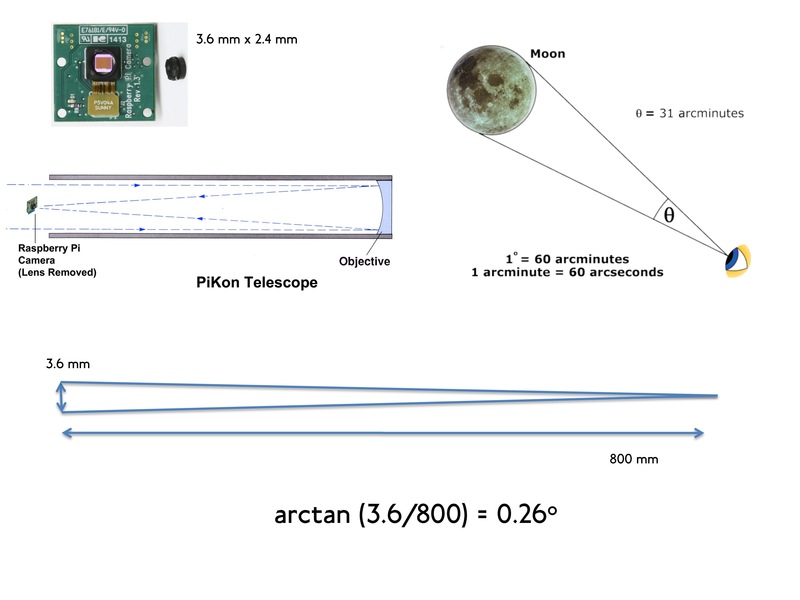 In the PiKon design, the Raspberry Pi camera is placed in the tube with no 45 degree mirror. 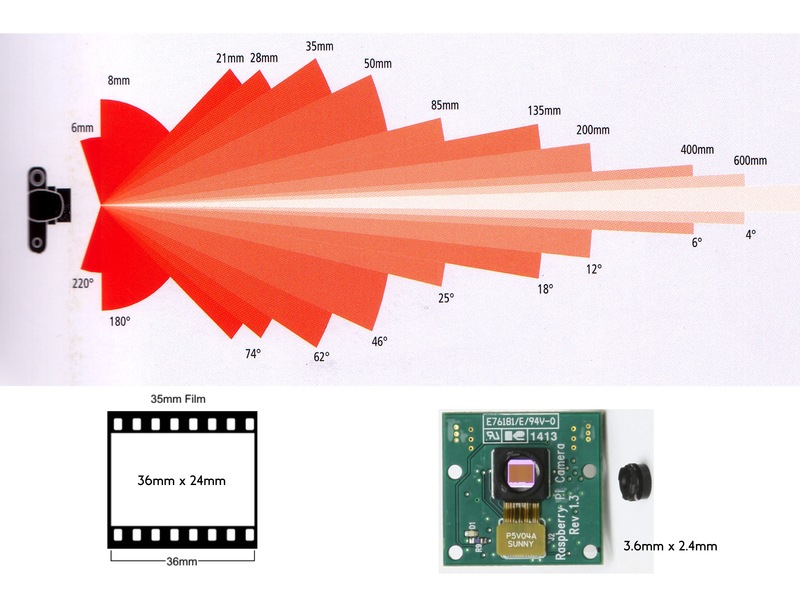 The size of the camera printed circuit board (PCB) is 24mm x 24mm, about the same size as the 45 degree mirror. The lens of the Raspberry Pi camera is removed, exposing the camera sensor. The objective mirror is 4.5 inches diameter (113mm) and a focal length of about 600mm. The telescope is operated using a Raspberry Pi computer, keyboard and monitor. Full details are in our assembly instructions. The PiKon telescope has a magnification factor of about x160. We’ve worked that out based on a standard 35mm film camera. 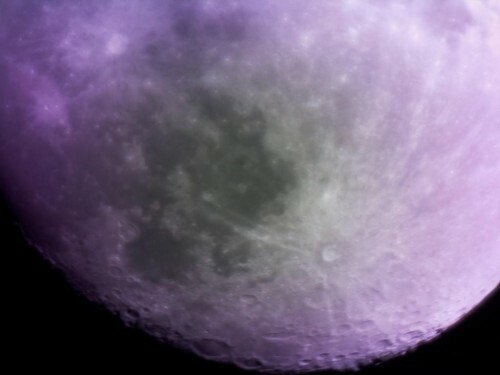 A 50mm lens there gives a x1 magnification. A 100mm lens gives a x2 magnification. The focal length of the objective mirror in the PiKon is 800mm. So, for 35mm film that would give a magnification of x16. But the Raspberry Pi Camera sensor is just one tenth the size of a 35mm film frame. So effectively the magnification is increased by a factor 10 to x160. What is the limit of magnification? The ultimate magnification of the PiKon is limited by something called Airy Disks. These are circular halos of light which surround a point image in the telescope. They are caused by defraction effects which depend on the size of the objective mirror and limit the ultimate useful magnification. The rule of thumb is that maximum useful magnification is 60 times the size of the mirror (in inches) or 2.2 times (in mm). The PiKon prototype has a mirror diameter of 4.5 inches or 113mm, which means its maximum useful magnification is x270.